When forward-thinking entrepreneurs came to us with the idea of rewarding athletes for their merit, while helping universities keep their athletic programs afloat; we were ready to help them fix the system. It’s a no-brainer—you get paid to work. 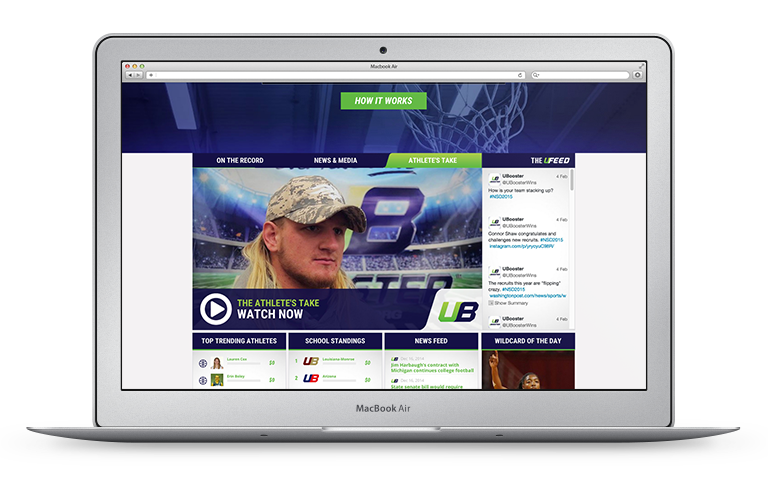 And, the creators of UBooster thought it was time to transfer this model over to college athletes. These creators came up with a system that would show athletes what they’re worth, that would reward colleges for honoring these athletes, and that would give fans involvement in their teams, their alma maters. UBooster came to us with a challenge, changing the way an established system works. We had to create trust, build integrity, and form the brand. From name and logo, to strategy and social presence, website and public relations, to events and nation wide campaigns, we took this inaugural concept and turned it into reality—a first of its kind, collegiate revolution.